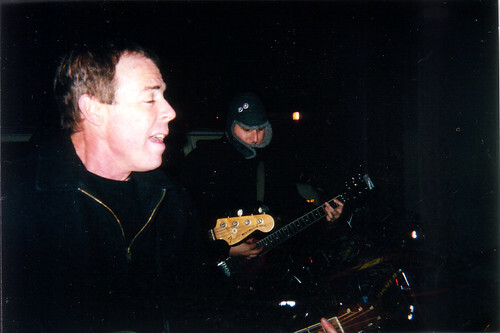 Mark the shark, originally uploaded by Jeff Hemmer. I don’t know what is my major malfunction. It’s not that I’m shame-based, but there’s definitely something that’s keeping me down like an awkward anchor. Not that I should complain too much. Yeah, it can be annoying when people roll their eyes at my allusions to WWII history/British politics/association football, but I’ve accepted that it’s just who I am. Why fight it? The thing is, I’m not that bad yet. I mean, I haven’t pissed in somebody’s desk drawer or anything… really, I haven’t. last night i was playing soccer with my indoor team from work, mclaughin. the name is a pun on the building we’re in – mclaughlin, but the second l is missing on one entrance. it’s great. anyhow, i was playing left back, my normal position, and i had some good steals, a could of nice headers, and i was feeling good. then i had a bad header. actually, my header was fine. i got the ball. the other guy had a bad header and got my head instead. this was within 5 minutes of starting. we stopped, made sure we were both ok. he seemed fine, but i guess i wasn’t. there was blood, and lots of it. it pooled in my goggles which made everybody think i had an eye injury. i had to get a towel, call dr j, and pack up, all whilst holding the towel to my head to slow the bleeding. it was apparently freaky to all involved but me. seriously, it didn’t really hurt and i was just annoyed i had to leave the game early. we went to the kaiser emergency room in oakland- my first trip ever to an emergency room. i wanted to take a picture of my bleeding head, but i figured that would be wrong. so here it is the morning after. it’s tender, but ok. no stitches or anything, just a little scab. it hurts but it’s all superficial. the wait in the emergency room was very interesting given the health care debate. lots of people there with flu-like symptoms. is it h1n1 in oakland? or do people just not have regular care so they just have to go to the emergency room when every they get sick? here’s hoping we don’t get sick. larry took this picture of of playing soccer at one of my games a few weeks back when he was in town. i am the rightmost orange speck in the picture. (team captain patrick is the second orange speck from right.) we won that game. actually, this team, fabulous orange, has been on a winning streak. yesterday we won 4-0, which in EBOTS is a blow out. clean sheets are very rare. of course, as a left back, i take pride in that score because it means i did an OK job. it’s weird when people compliment me on my playing, because i still feel like i’m the worst player on the field. i guess even if that’s true (which it probably is), then it’s not such a bad thing since many of the other players are really good. i don’t want to jinx our 5 week winning streak, though i won’t be there next week (internet librarian, yo!) so i won’t have any thing to contribute. i really like playing on this team and i have to say, winning feels all right. last night at gilman, we were telling people of our awesome game that afternoon, it was clear people lose interest pretty soon. if you ever want me to tell you all about my love of the beautiful game and to tell you about my exploits in the back field, just ask. i’m not quite as good at telling people about what others should have done, but i’m getting there. my indoor team is in the play-offs. we play tomorrow night. maybe i’ll talk about that a bit? i’m terrible at indoor though, so let’s just talk about outdoor. did you know that dr. frank, aka frank portman, wrote a new book? if you didn’t, you should check out andromeda klein. 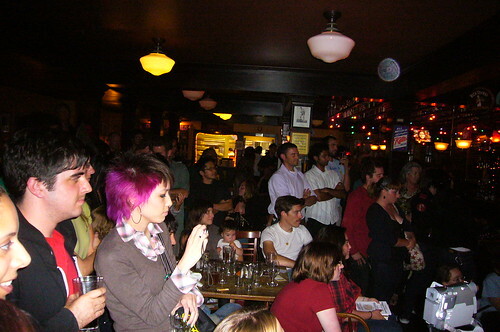 he had a book release party at cato’s this past week, which i streamed online with ustream. it was fun and packed and pretty great. i never saw so many people in cato’s at once. i’m surprised “erika hynes” is 2nd. numbers 1, 3, 4, 5, 6, and 10 are all the same theme and make me consider deleting that post. the others… odd, but whatever. “erika hynes” was briefly in the top 10 in april, the month she passed away. i did post about her, and it’s sort of been weird how her memory and spirit seems to keep popping up. the release of andromeda klein has introduced erika to a whole new audience. (frank dedicated the book in her memory.) i wish everybody knew her and i wish she were here. hello, little neglected blog. i figured out why i’m neglecting you… it’s me, not you. i’m trying to not be such a shut in, which means i’m not tied to the laptop so much. see, i’ve decided i need to not only get out more, but be less concerned with with what other think of me and just do stuff. it’s obvious advice, right? the sort of thing that when somebody tells you when you say, “oh, relax and just be yourself” or “everybody’s so worried about themselves, why should you be?” and of course when somebody says that you just roll your eyes and keep stressing about yourself? well… i’m trying to stop doing that. it’s been a slow process because change is hard and i don’t want to do too much and then retreat back into my cave. graduating from school has been great. not having to worry about assignments or class participation has created a lot of free time. this wasn’t really noticeable until mid-march because of work stuff, but really, it’s nice having evenings and weekends free-ish. i’m not as stressed as i was last year. i have my health. it’s always weird when people ask me “how’s your health?” it’s a loaded question. what they’re really asking is “you don’t have cancer or some other life threatening disease, do you?” well, the answer is i feel good! yeah i’m out of shape, but i’m not as tired all the time. the most obnoxious thing is still being weak from the mastectomy, but that’s just something that i have to deal with for the rest of my life. but i feel dandy. so these two things have made it easier for me to just go out and do stuff. or try things. i’m knitting again. i’m actually reading books. and today i started playing soccer. see, it’s progress. overall, i feel like i know what i’m doing. not in a huge sense with a grand plan, but i’m trying. Rinsing, originally uploaded by kendrak. this is something for both my parents. tonight i used my sinus rinse for the first time. my sinuses have been bad for a while, and i figured it was worth a shot. did it work? sort of. one side feel great. the other side, not so much. this was my first try through. i’ll do it again in the morning. it was a weird sensation overall though – somewhere between getting water in your nose and choking on it. i think one i get used to that sensation, it’ll be easier. oh, and this is totall an action shot. see the water? 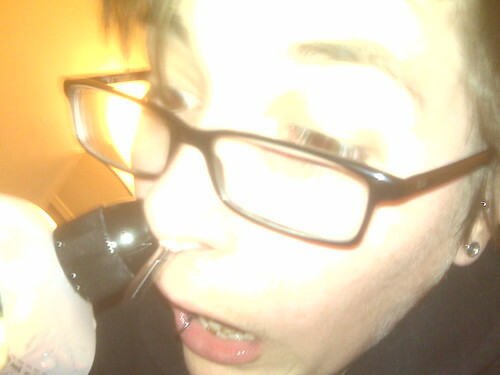 it came from my nose! bloomin’, originally uploaded by kendrak. again! 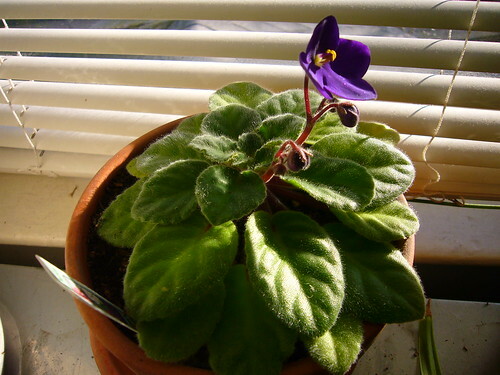 my african violet is rocking. i am awesome. 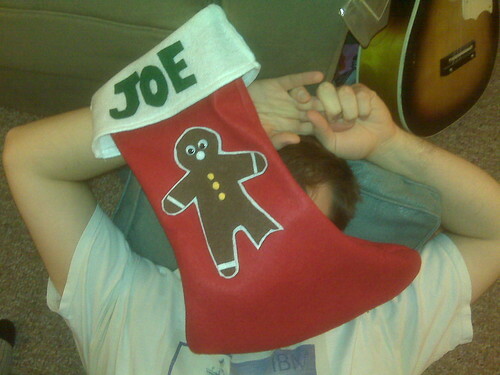 Joe’s stocking, originally uploaded by kendrak. we made stockings. this is dr. j’s. notice the missing foot.